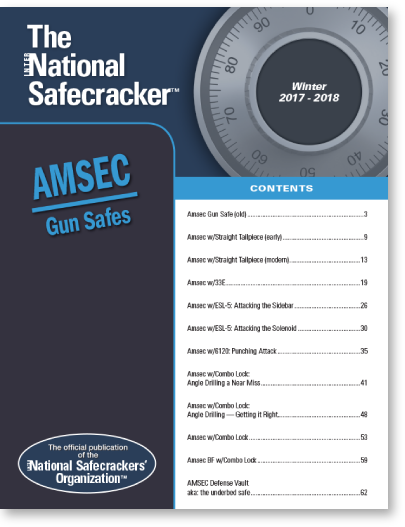 For professional safecrackers, NSO now offers a magazine and a forum. These can be purchased separately, or together as a package at a huge discount for Dual Members! The first 500 Dual Members lock in their rate — it will never be raised. Track Record. The International Safecracker (formerly The National Safeman) has provided industry professionals with reliable, field usable information for more than 25 years. Depth. Going forward, the focus of the magazine will be on in-depth articles on particular safes and safe locks, to complement the remarkable breadth of threads at the Forum. Downloads. In addition to the current issue, the last year’s worth of magazines are now available for new members to download. Discounts. Members can purchase any of Dave McOmie’s databases at 50% off. Every safecracking question gets an answer. No one is left high and dry on a safe opening job. 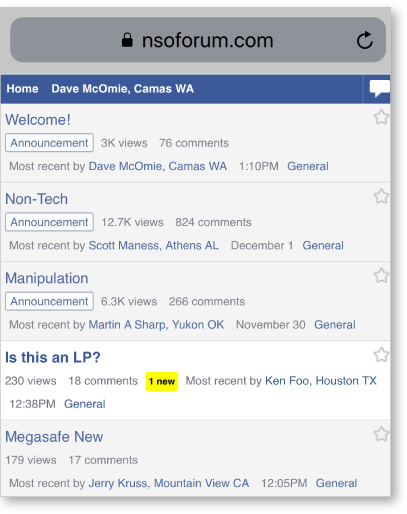 Optimized for mobile devices (screenshot shown at right). Easy to post questions in the field directly from your smart phone, including simple photo uploads. Content can be downloaded directly to your computer. Nothing is view-only. With nearly two thousand threads already, content is growing exponentially at the Forum, so a powerful search engine is in place that can search by title, subject or user. Members can purchase any of Dave McOmie’s databases at 50% off.